The Conference participants heard the reports within the framework of the Conference subject, exchanged views, considered the issues of integration processes in the Eurasian space, their impact on the development of national transport systems and transcontinental transport corridors. 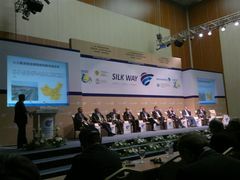 The Parties discussed the possibilities for the development of new trade routes, transport infrastructure and logistics, financing of transport infrastructure involving Kazakhstan, foreign and international institutions; the activities of the Economic Cooperation Organization in the sector of transport and communications as well as the activities of TRACECA concerning the integration processes of the corridor development. Mr. E. Biriucov, Secretary General of TRACECA noted that in view of progress, the existing potential of the TRACECA region should be developed in full measure through the realization of strategic objectives: promotion of the development of TRACECA routes, creation of transport links within the corridor system for the near-term outlook, arrangement of container traffic with the view of launching container block trains with fixed schedule, observing coordinated tariff policy by the TRACECA countries. 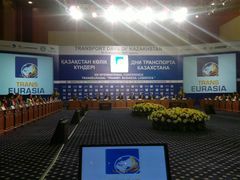 During the Conference the Parties also noted the significance of the Eurasian Transport Communication Project (EATC) of UN ECE and UN ESCAP, implementation of the IRU “Model Highway” Initiative in the Euro-Asian region for the purpose of the Great Silk Road revival, strengthening of the public and private partnerships, emphasized the importance of simplification of visa issue to professional motor vehicles drivers in international traffic, implementation of trade facilitation measures, including introduction of regional customs transit systems. This event served the basis for creation of a dialogue platform between the representatives of public and business structures for the solution of urgent issues in transport sector and its development prospects under the processes of stimulation of integration with the international transport networks.